The Weekend Gourmet: The Weekend Gourmet Celebrates FOUR YEARS!! 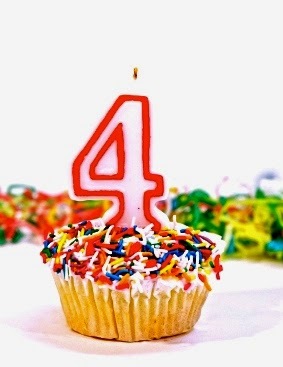 The Weekend Gourmet Celebrates FOUR YEARS!! Four years. It's hard to believe -- but as of August 14th, that's how long The Weekend Gourmet has been in existence. Honestly, I'm simply amazed that something that started out as a simple creative outlet has evolved into something so much more. My first post was August 14, 2010...it took me 3 hours to figure out how to insert pictures and get my article posted. I also vividly remember being stunned that more than ONE HUNDRED people were actually interested in what I had to say about food! The first recipe that I shared was Turkey Meatballs with Pancetta and Sun-Dried Tomatoes. The pictures aren't that great, but the recipe's one that I still make to this day. Slowly and steadily, people started visiting and commenting on my recipes -- and I discovered that I really enjoyed cooking and sharing my love of good food. Within a few months, I decided to really put my all into making The Weekend Gourmet something to be truly proud of! Four years. During that time, The Weekend Gourmet has continued to grow and change. Every change was a natural progression that stems from my love of food, and they somehow fell into place at just the right time. About 3 years ago, I started The Weekend Gourmet Dines Out, a monthly post that features mostly regional restaurant profiles. In addition to cooking and dining out, travel is something else I truly enjoy. As a result, I added The Weekend Gourmet Hits the Road and A Food Lovers Weekend In... series 2 years ago. 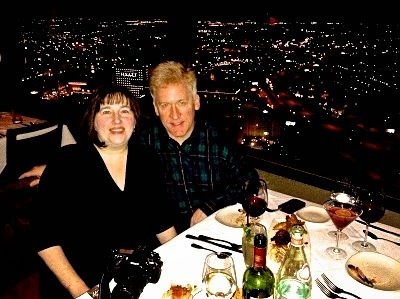 The dining out and travel series have allowed Michael and I to explore dining-out and culinary travel options in Texas and beyond. We've featured the best food and attractions in cities like New Orleans, Las Vegas, New York, and Cleveland -- and we have other great food destinations in mind for the coming year. Michael is now my official Dining Out and Travel Photographer, which allows The Weekend Gourmet to truly be a shared experience for us to pursue together! Four years. Over that time, I've published 632 posts. That's a lot cooking, eating, and traveling! It also equals countless hours spent taking and editing photos and sitting in front of a computer typing. I have a busy full-time day job during the work week. That means what you read here takes place almost exclusively during evenings and weekends. I love every single moment of food writing, but it certainly keeps me busy! The Weekend Gourmet has also allowed me to do things that I never could've imagined when I started this blog. For starters, I've cooked on live television, covered the James Beard Taste America event for Gulf Oyster Industry Council in New York, and co-presented a Media Kit workshop at this year's Food & Wine Conference in Orlando. Here's to FOUR AMAZING YEARS! So, what's ahead for The Weekend Gourmet in Year Five? For starters, I promise to keep on sharing the Big-Flavor recipes that I love to cook. I'll also feature the very best restaurants located in the vibrant, growing San Antonio-Austin food scene. Finally, we'll keep showcasing the best in culinary travel in the United States...and hopefully beyond! Beyond that...who knows what the future holds?!?!? I always keep myself open to new possibilities and embrace any opportunities that come my way. I hope that The Weekend Gourmet has inspired you to get in the kitchen and cook -- to push your boundaries and try new foods and cooking techniques. To me, that's what life's all about: good food, time spent with family and friends, and lots of laughter. Oh, and a glass of good wine too!